I mentioned the character Bender from Futurama in a recent post. 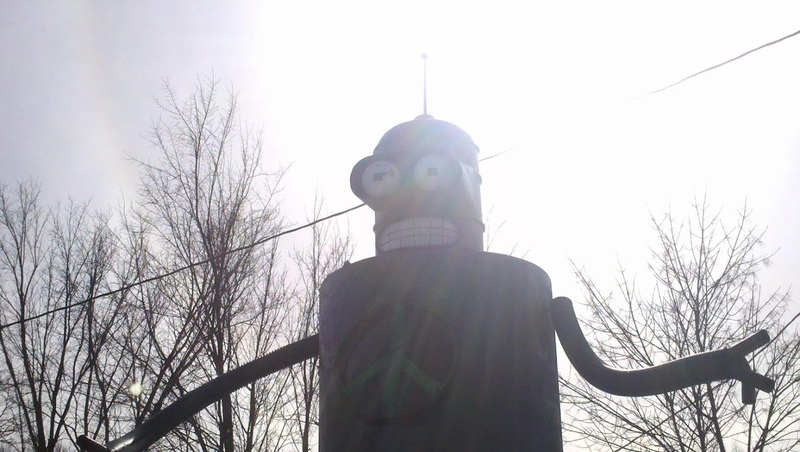 Coincidentally, Jason was working on a project near St. Louis yesterday and happened by a statue of Bender in Dittmer, MO. The statue is displayed at Dittmer Auto Repair wearing a peace sign medallion which appears to have been made from a tire rim. It's about 10 miles off of Route 66 which is appropriate considering the kitschy nature of the statue. "I Am Bender! Please Insert Girder!"